This entry was posted in Birds, Ecology, Nature Education, Science, Uncategorized, Zoology and tagged backyard feeders, birding, birds, downy woodpecker, Environment, nature, woodpeckers, yellow bellied sapsucker. Bookmark the permalink. Hi, Tara – while birds in general are facing frightening population losses (60% drop in the US since 1970), the Pileated Woodpecker is not considered endangered nor threatened. But it is important that wherever possible, dead trees, stumps and snags be left standing as Woodpeckers greatly depend on them for nest sites and insects. Moreover, many other bird species rely upon woodpecker-excavated cavities for their own nest sites, including Owls, Bluebirds, Chickadees, House Wrens and Tree Swallows. Looking forward to more on your Pileateds!! I took a few photos of a gorgeous male pileated woodpecker! We live in the Ocala National Forest. How wonderful! I’ve got a few, as well. They are quite amazing up close, aren’t they? Happy birding! Just saw this pileated woodpecker going a stump here in Herkimer, Ny. Wow the size on colors! My boyfriend and I had to drive by twice just to see him! Amazing spotting. The Pileated amazes most when first spotted. Very exciting! I’m in Fairport, NY. Today (1/24/18) a hawk, which I think was a big Cooper caught what I think was a Northern Flicker in my back yard. The Flicker was screaming (that’s how I noticed it), so I went out and tried to chase the hawk away, but the hawk grabbed the Flicker and flew behind the garage next door. I went back there and found the Flicker. I tried to prod him gently with a stick to get him to escape, but noticed the hawk had broken his wing. The hawk was waiting right above me so I decided to let nature take its’ course and I left. I felt so bad, but I guess the hawk has to eat too. 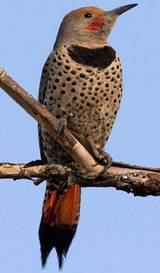 Is the Flicker common prey for a Cooper? Hi, Jeff – It’s always quite stunning when one witnesses a predator-prey encounter. But, as you note, it is the way of life and everyone has to eat. Birds are a common prey item for the Cooper’s Hawk, as well as the Sharp-shinned. These are the two most common hawks we see hanging around bird feeders and other places where smaller birds gather. 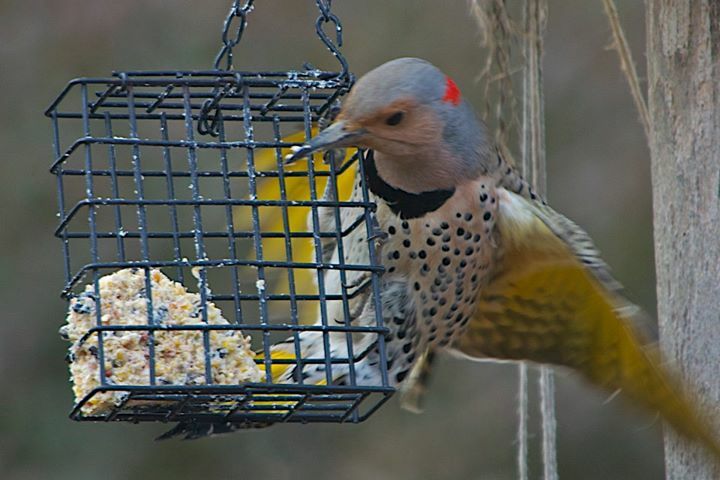 The Northern Flicker is more vulnerable to hawk depredation than other woodpeckers in that it regularly ground feeds, being especially attracted to ant hills. You’ll remember this encounter for many years to come. While we may want to intervene in such events, in general letting things play out naturally leads to either a quicker end for the prey animal or, in some cases, may help in their escape. When an animal is being pursued by a predator, when we approach, the prey perceives a second threat and takes its eye off the initial predator, making it more vulnerable to capture. So, despite our good intentions, it’s really best to let things be. Tough choice, I know, having been present for a number of predator-prey interactions myself. But when we approach such events without emotion and consider the energy cycles/food webs inherent to life on Earth, we connect more closely to those cycles and our place among the other species with whom we share this planet. Thanks for sharing! Thanks so much for your insight. Yes, I won’t forget that. Now I worry that there’s a beautiful woodpecker freezing to death back there because of the broken wing and a hawk that worked hard for a meal hrs won’t get. Oh well, live and learn. Thanks again. Jeff – do not worry about the woodpecker freezing to death. Someone has already made a meal from it, perhaps even the hawk! 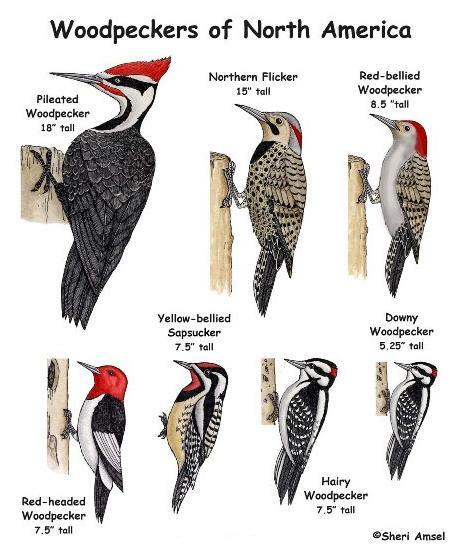 there is another woodpecker that looks very much like the pileated and is an inch or two different in length. that is the one critically endangered . some believe already extinct.